Check out our updated review of QxMD Read here! 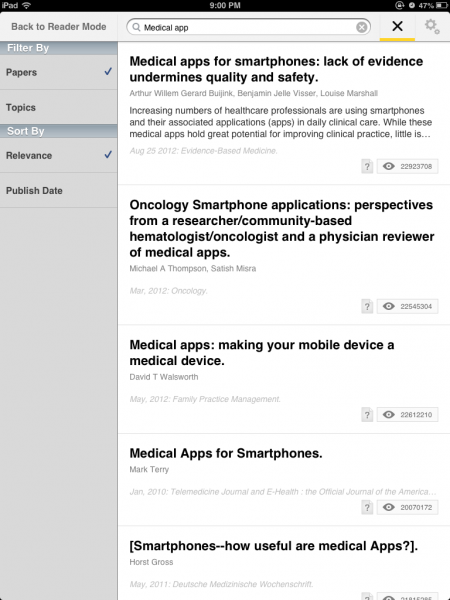 Using a mobile device to access the medical literature via an app is a new development in the medical app market. 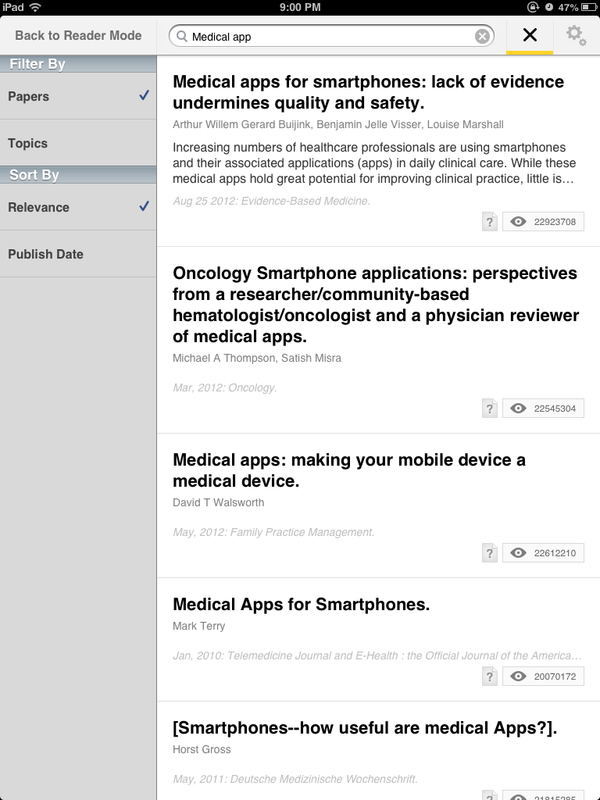 Several apps currently exist, and QxMD has recently released a new app to help easily read journal articles. One thing that QxMD is trying to do is create a very user friendly app to help navigate medical journals easier and intuitive for users. 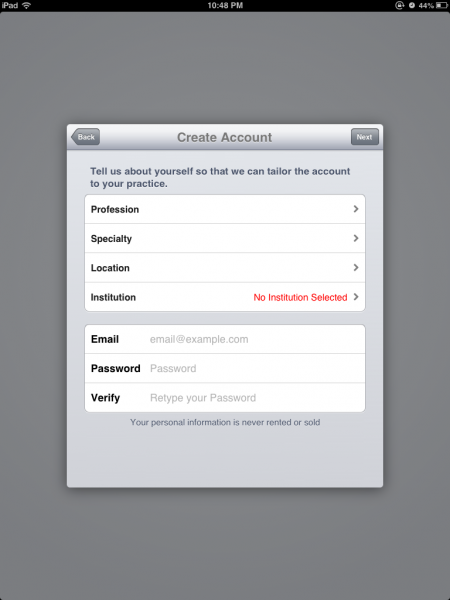 Upon opening up the app, the user will need to create an account with QxMD. The user will also need to enter their password for proxy access to their institution library to gain access to all of their medical journals. Upon finishing this, the app opens up to a easy to use interface. 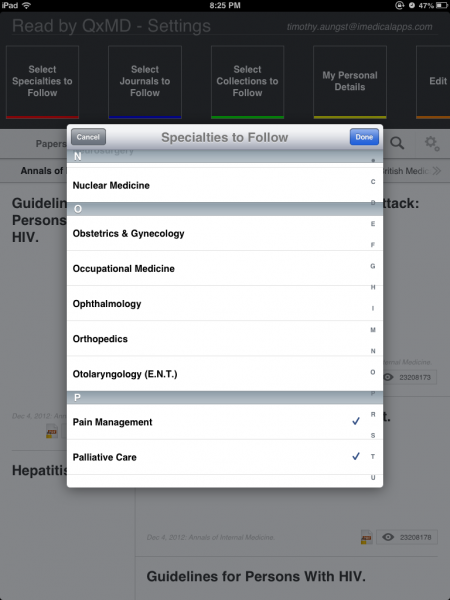 Key features of the app is the ability to select what journals or specialty that the user wishes to have quick access to and update. For those familiar with Zite of Flipboard, this is very similar to following a website or topic. 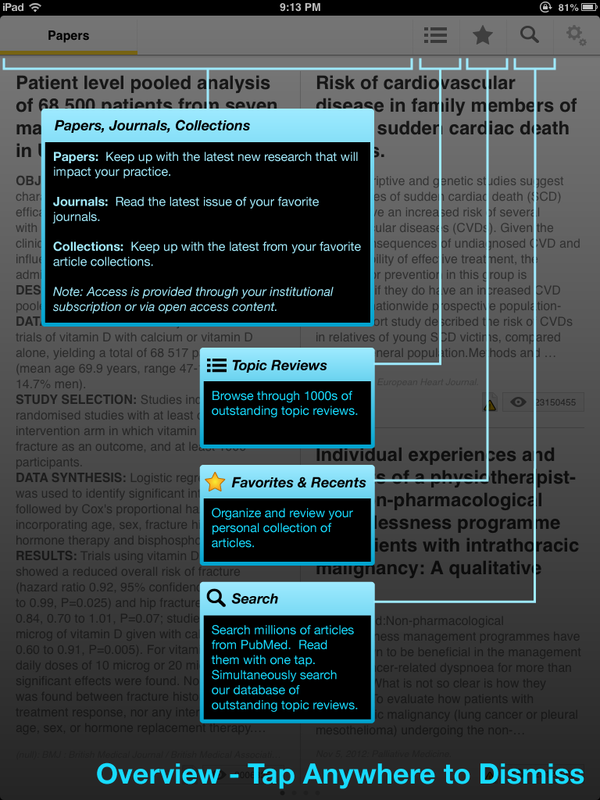 After selection of the journals and specialties that the user wishes to follow, it is very simple then to navigate the app to find and read articles. 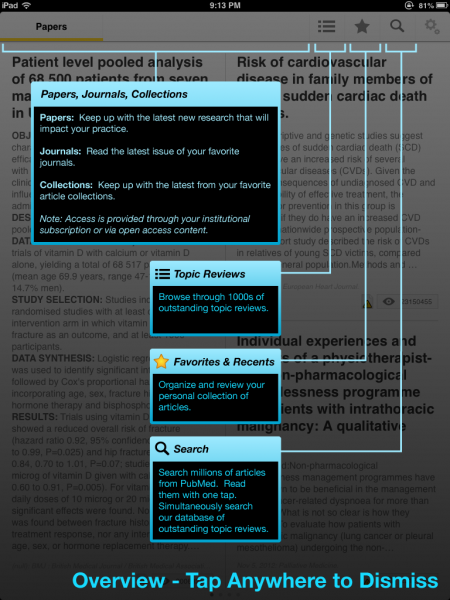 Browsing is easily done by sliding to the journal the user wishes to read. After selection of the journal, the user then ‘flips’ with their fingers the journal like a book to see articles published. 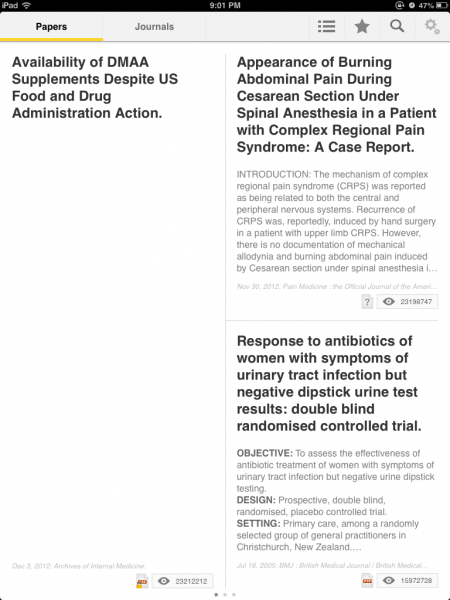 A short synopsis is given that usually follows the abstract such as on Pubmed. It is also possible to search key terms for articles that may be of interest to the user. 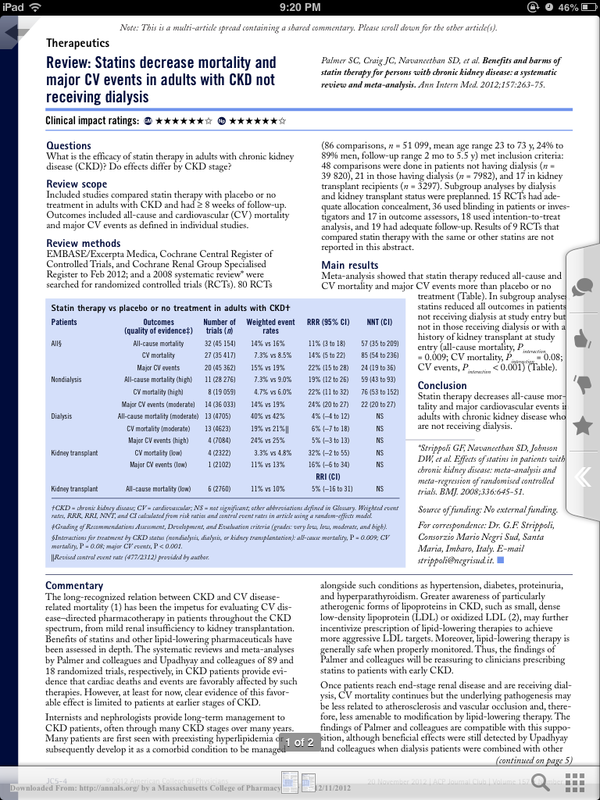 Once you select an article, the article will then be downloaded via the app for the user to then read in full. 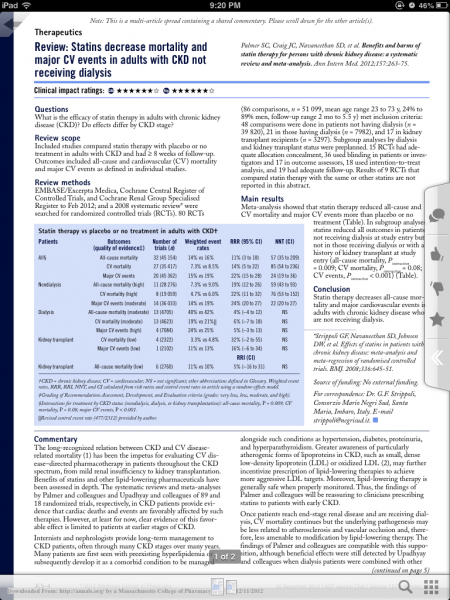 Tapping the finished downloaded article will then bring the user to the full PDF. A nice feature of the app is the ability to then share the article with others via Facebook, Twitter, and also by emailing the document to others. Articles can also be favorited to access later. 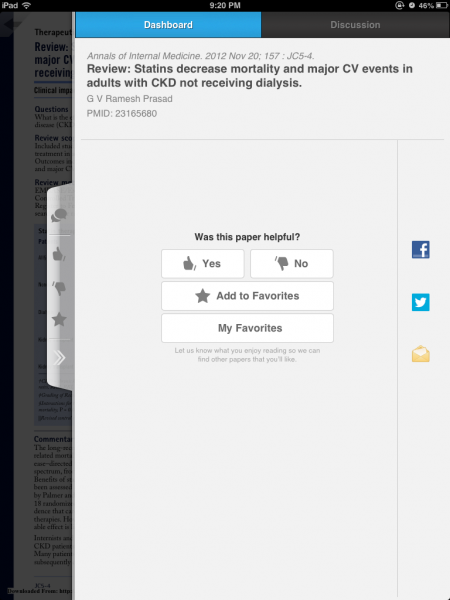 There is also the ability to post to a discussion board about the article as well within the app. One thing that users may feel uncomfortable is what data is collected from their use of this app. 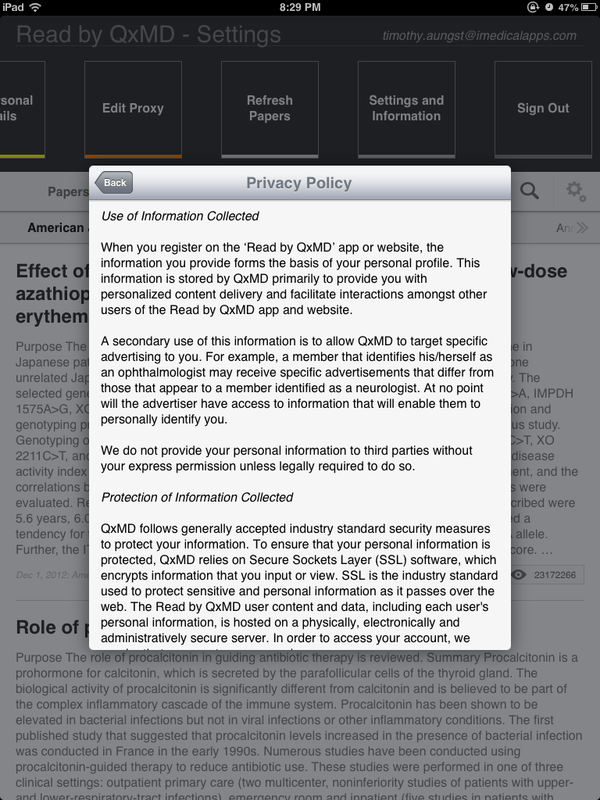 However, QxMD is pretty transparent about their use of user data in the privacy section of the app. 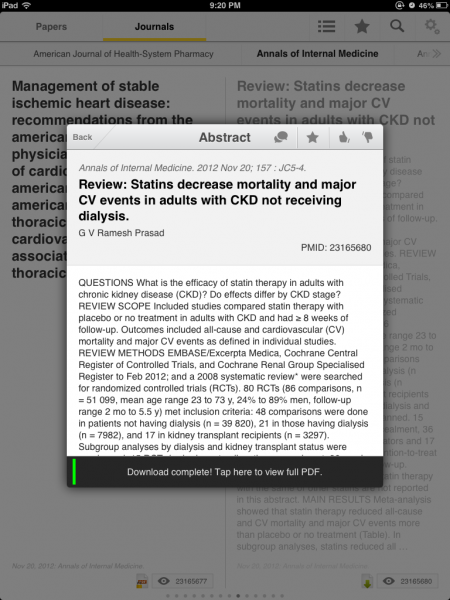 Read by QxMD is a very well laid out app that is very easy to navigate and use to browse the medical literature. The ability to share selected articles is great and will be very useful to those that work with others through collaboration. Thanks for the thoughtful and kind review of ‘Read’. We would like to point out that we feel our algorithmic curation of the literature is perhaps the greatest strength of this app. Rather than simply relying on our users to tell us which journals they want to read, we use a combination of machine learning, semantic analysis, crowd-sourcing and proprietary algorithms to figure out which articles our users should likely be reviewing. 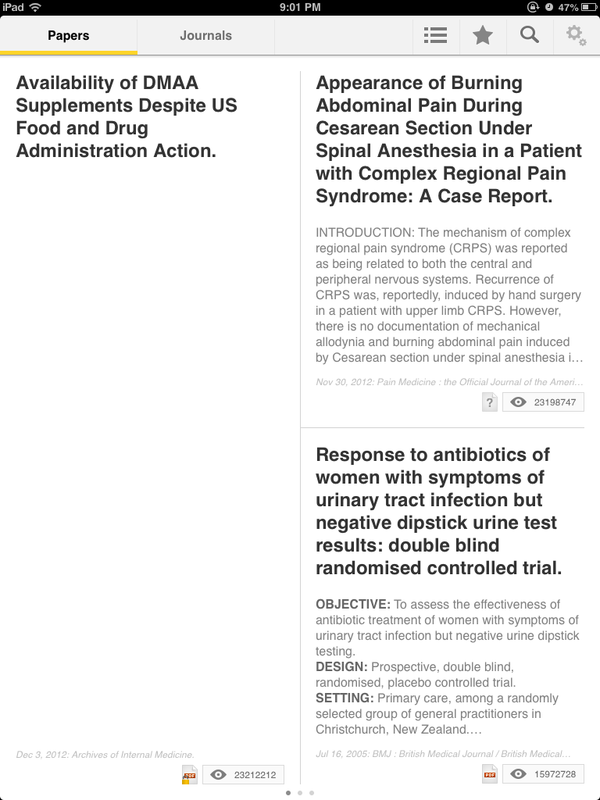 So far, our users have been amazed at how well ‘Read’ finds articles that impact how they practice medicine and care for their patients. We hope that Read can serve as the only personalized medical journal you will ever need. Please send any feedback or suggestions to contact@qxmd.com. QxMD is certainly a good idea. 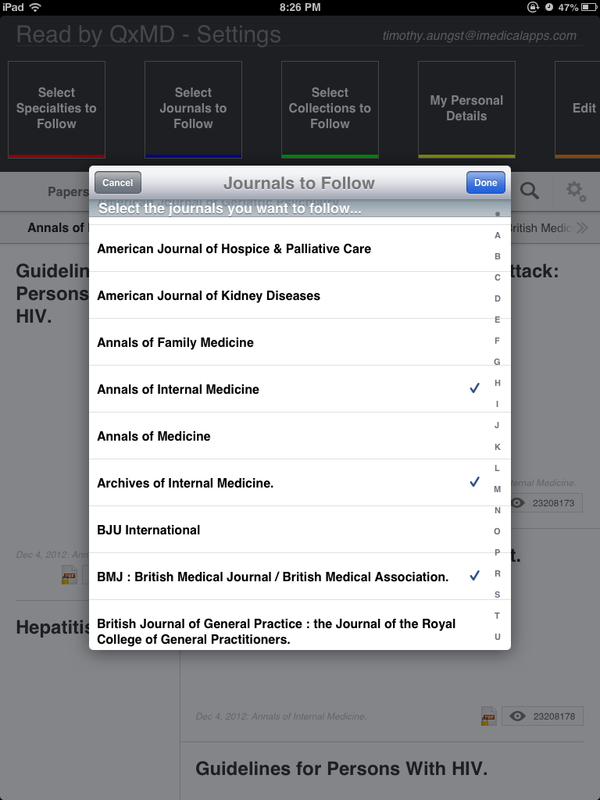 I personally don’t like that each and every journal should have there own App. At the first glimpse I thought that access for not listed institutions or access via IP authentification (instead of password based) were not supported. But fortunately that was wrong. By choosing “no institution” I was able to access the subscribed journals of our (German) campus. Dislike: You can choose out from some 360 journal only, that way to few. 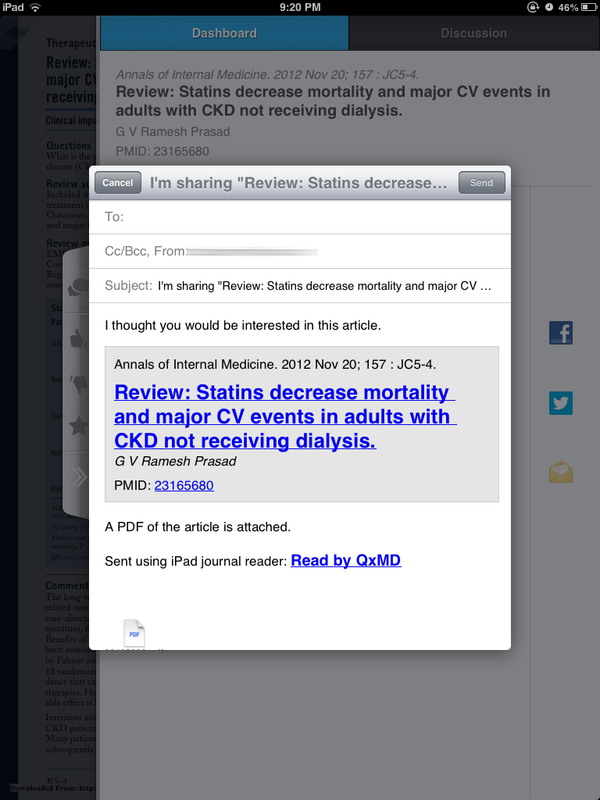 QxMD should at least support all PubMed journals. Dislike: Somewhat confusing layout. QxMD should make use of the respectives table of contents. Otherwise nobody knows if he missed something. I agree about each journal having their own app makes me hardset having so many apps on my device. I like it collected all in one. 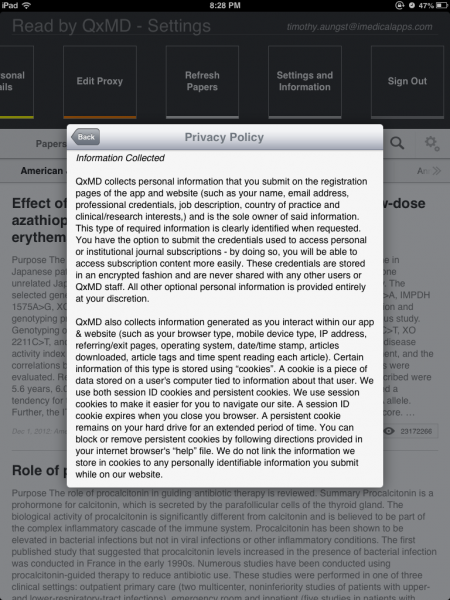 As to the journals not being available, I would recommend emailing QxMD. They have added a lot of journals for me that they originally did not have when I performed my review, and had a quick turnaround time! Let me know if that helps. Additionally, the layout I think could be confusing for some users, I use Flipboard and Zite a lot, but even then some aspects took time adjusting to, but worked for me. I do like the table idea, maybe a checklist off of ones your have already read or favorited would be good as well! Thank you for your comment and reading iMedicalApps! Have people found this helpful as more of a learning/self education tool catered to your tastes, or for efficiently accessing journal articles for point of care decisions? The app seems more targeted towards the former which is a very important problem, but its the latter that I’d love to see solved. We have such an amazing amount of medical knowledge, but its not available for most clinical decisions beyond algorithmic clinical decision support. I often wonder why Google hasn’t done well in their journal search business, (or maybe they have?) given how good they’ve gotten at predicting what I want to see when I generally search. I just need one more thing. Either some kind of integration with sente (so the pdfs are there on my desktop and in a reference manager for citation purposes), or some kind of more basic export of the pdfs via iTunes to my hard drive (where I can put them into sente if I want). More generically put, this app would be fantastic with any kind of reference manager integration. Or am I missing something? Is it syncing the pdfs via iTunes to a folder on my hard drive without me knowing? This may be a need of a group outside its target audience–perhaps this, as its name suggests, is for those who just need a reader (rather than those who funnel what they read eventually towards research/teaching and so need a reference manager). This App is what I was hoping to find. A place to go — for school research and for future continued professional development — that has all the information (most/many journals) in one App. I can email myself an article, open it in my favorite PDF annotation App, then review the information while making highlights and comments. Later, I can easily send it to a professor or the team I am currently collaborating with to care for patients. This App makes it much easier to incorporate “Best Practices” &/or Evidenced Based Practice at the point of care. By giving me a great UI, tying my University Library account to the App, and having it on all my iDevices, I can achieve a great return on my invested time (even if I can only find 10 minutes while waiting in line at the grocery store or 20-30 minutes in between meetings, etc.). This App allows me to stay up to date on changing Nursing Interventions so the patients I work with may receive the best and latest innovations in care. Thank you QxMD and iMedicalApps. The best thing about this app is the institutional login, which really saves time from other workflows, logging in, switching back and forth from an rss reader, to journal websites, to pubmed, etc etc. Would appreciate a better iOS integration to “open in” other apps for the pdfs, allowing to open in an annotator app or evernote for instance would be great. Emailing works but is rather cumbersome. I real like the idea of this app. However, institutions here in Brazil don’t usually give their med students credentials for medical journals access. 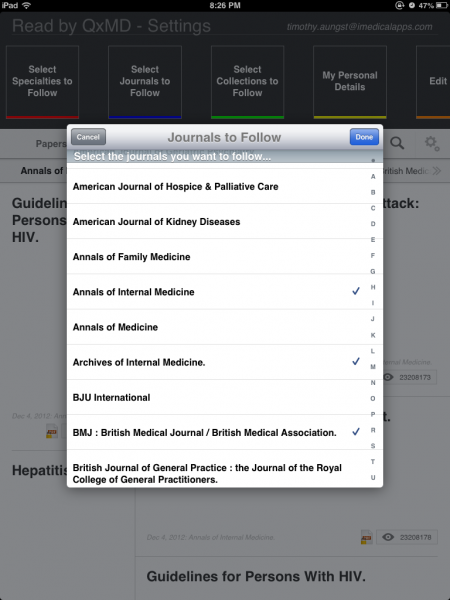 Is there an app for medical journal access for anyone without any affiliation to institutions? Thanks in advance.